My son loves fighter planes. 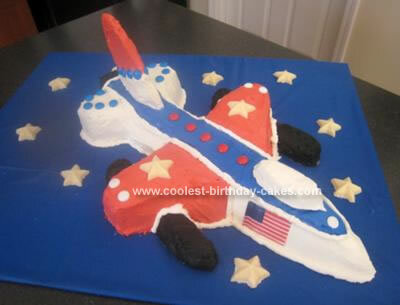 So for his 3rd birthday we decorated with F-22s and F-16s. For his F16 airplane cake, I took his favorite plane and drew it out on some graph paper. This helped me get the dimensions right. I then took those dimensions and optimized it to cut out the correct pieces from a half sheet cake pan. My mom and I then began to test how we wanted to decorate it. We first started out with grey icing. Not so pretty. We then settled on Red, White and Blue after finding some pictures on line that we liked. We embellished with chocolate candies and a couple paper American flags. We even made some molded white chocolate stars for the blue night sky and wings. This was served with traditional all American slider burgers and mini hot dogs. We had a lot of fun. Hope you enjoy the pictures. Also – to help make it more simple (decorating took us long enough) we used the best box cake mix we could find and had our local grocer mix up the butter cream icing in the colors we wanted. Worth it!! The icing makes the cake after all. I just cant believe how well that turned out! Great job! Dawn is really so clever to figure this out. Great job! What did you make the tail out of?